In simple language, here’s how it works. 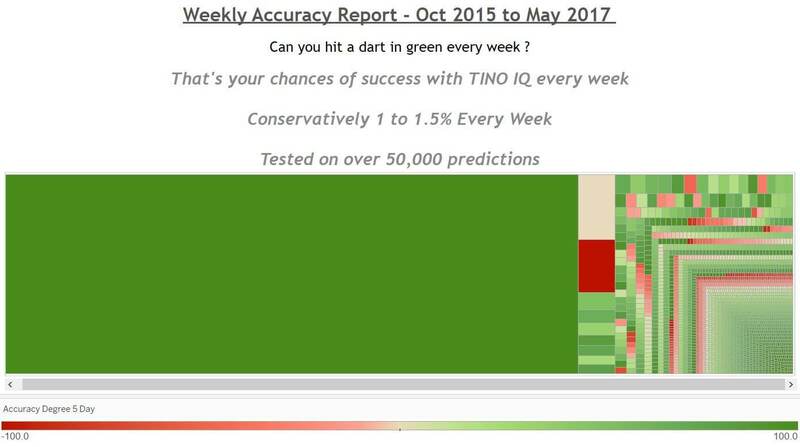 Every week, on an average 3 out of 4 predictions meet their target 100%. For example, say AAPL is trading today @ 100 and our prediction is it will reach 102 between now and before the close of next 5 trading days. If it reaches even 101.99 during this period, we would say it was a failed prediction. If it reaches 102 on the 6th trading day or later, we would say it was a failed prediction. In the chart above, the dark green represents 100 % successful predictions, Lighter shades of green indicates how close it came to our target. Red means the price opened in another direction and never came back, Brown means that the price kept on hovering around initial price. First on the list, and coincidentally also the first event chronologically, would be the Chinese market crash in January 2016. People around the world were happily welcoming the new year with open arms, but it was the exact opposite for investors, who faced a dreadful start in the markets. Britain’s decision to leave the European Union, more commonly known as Brexit, would definitely be one of the major events this year. On 23 June 2016, 51.9% of all Britains voted YES and led their country out of the 23-year-old country union. However, the downward trend did not persist for long. Markets quickly rebounded as investors began pouring money into the US economy, following Trump’s promises for large tax cuts and massive government expenditures. Within a day, the Dow Jones Index shot up by 257 points to 18,589 while the NASDAQ increased by 58 points to 5,258. On 14th of December 2016, Janet Yellen the chairman of the U.S. Federal Reserve announced the Federal rate hikes as expected by investors worldwide.